The next form and more advanced stage of Altitude Sickness is: High Altitude Pulmonary Edema (HAPE) which is excess fluid in the lungs. This causes extreme shortness of breath a high temperature and coughing frothy spit and blood. HAPE usually develops after 2 or 3 days at altitude above 5500m. The breathlessness will progress and soon the individual will lose the ability to breathe even at rest. Other symptoms include a high heart rate and blue lips. It is easy to confuse symptoms of HAPE with a chest infection. If you suffer from symptoms of HAPE must be suspected and the affected individual must be evacuated to a lower altitude. The last form of the altitude sickness is High Altitude Cerebral Edema (HACE) which is a build-up of fluid in the brain. About 1% of people who ascend above 3000m get HACE. The lowest altitude at which a case of HACE has been reported was 2100m. HACE is life-threatening and requires urgent action. HACE can lead to death in only a few hours. A person with HACE will find it difficult to walk in a straight line. This is a useful test to perform on someone with severe symptoms of acute mountain sickness. Inability to sit up or walk in a straight line. See your doctor for information and advice before your trip. Some climbers believe that switching to a high carbohydrate diet before they go trekking helps to reduce the risks. Only climb/trek with experienced guides. Increase your fluid intake. You may need up to seven liters every day. 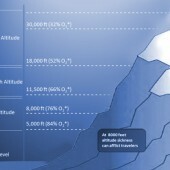 Be aware that you are at increased risk of altitude sickness if you have experienced it before.